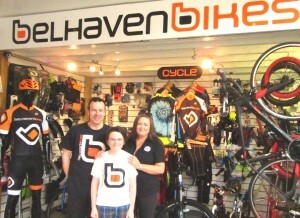 We are Belhaven Bikes, born 2005. We sell bikes, skateboards and scooters for all generations to have fun on. We love to give you a wide choice so all tastes and budgets are catered for. You can buy scooter products from us online now, so please check out our range of Complete/Custom Scooters and Parts/Accessories. There’s over a hundred products in our online shop but we can access far more, just let us know what you’re looking for. Our honest, professional service can help you choose the right bike or product for you. We can also get you back on the road again after a service or repairs in our Cytech Accredited workshop. Oh, and we’re a member of the Association of Cycle Traders too. This was our tenth anniversary year and we started it with even more reason for celebration! In February we were chosen to be a Top Twenty finalist is the UK’s Best Small Shop competition. In our submission we showed how proud we are of our position as the local bike shop, located in the heart of our community with the community close to our heart and how we serve our home town of Dunbar and beyond. We also demonstrated what our small, environmentally positive, family business offers in terms of flexibility, personal service, local contribution and sustainability. Engaging positively and proactively with our community means a lot to us and we are proud to support amongst others, our local schools with free, bike safety checks in preparation for Bikeability lessons and events such as The Big Pedal, working with theSPACE skatepark in North Berwick organising events and assisting with mechanical back-up at Berwick Wheelers and Tweed Tri cycle events. Here’s our slideshow video celebrating ‘Ten Years of Belhaven Bikes’. Our News item recapping 2016 and video capturing the memories can be found here. Our News item recapping 2017 and video capturing the memories can be found here. Our News item recapping 2018 and video capturing the memories can be found here. Join in with the Belhaven Bikes Community to keep in touch. See our News, swoop into Twitter, check out Instagram or contact us here.